This episode of RunAs is brought to you by SQL Intersection. 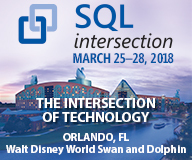 Eight full-day workshops and over 40 technology-focused sessions make SQL Intersection a unique source of the best information around SQL Server from real-world consultants and members of the SQL Server team. You'll learn proven problem-solving techniques and technologies you can implement immediately as well as learn about the future of SQL Server. Get answers to performance monitoring, troubleshooting, designing for scale and performance, cloud, as well as new features in SQL Server 2016 and 2017. It's time to determine your migration strategy and SQL Intersection is the place to figure out the best way to do it. Come to SQL Intersection at the Swan Hotel in Orlando, March 25-28. Use code RUNAS to get a discount on your registration at sqlintersection.com! See you there! Modern security is complex - how can the cloud help? Richard chats with Paul Keely about his work with organizations helping to secure workstations and using the cloud to get insight into the kind of attacks going on and how to mitigate them. Paul talks about security starting with administrators, who are now the key vector to exploits in the modern cybersecurity age. Just Enough Administration, where there are individual accounts for each service that an admin uses and the accounts are logged, emailed and meant for short-term use only. There is a large array of tools provided by Microsoft both on-premises and in Azure - it takes awhile to sort them out, but they are powerful! Paul Keely has been a Microsoft MVP in 2010 for System Center Operations Manager and co-authored the book Mastering SCOM 2012. Today he is an Azure MVP and the co-founder of Born in the Cloud, a Microsoft managed gold partner in the cloud and Enterprise Management Systems. His latest book Microsoft Cloud at the C-Level is designed to help people understand the cloud security stack of Azure and Office 365 E5. He focuses on helping customers secure their administration workstations, Office 365 and Azure.